If you’re operating a warehouse you probably are aware of how filthy your buildings can become. No matter what you do to prevent these industrial buildings from accumulating so much dirt and grime, you’re still going to need to address all that uncleanliness for a few reasons. Keeping your warehouse clean, especially the floors, is essential to workplace safety. According to the U.S. Bureau of Labor Statistics, every single year, the warehouse and storage industry experiences 15,000 injuries. The majority of these injuries can be attributed from slips, trips, and falls. 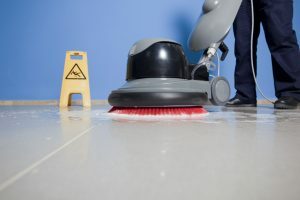 That’s why it’s so important to have clean floors and pickup any spills immediately to prevent further damage to company property and especially prevent workplace damages. Even without workplace injuries, having a dirty work area can have a negative impact on everyone at the warehouse. If the place were you spend most of your time is completely filthy, you’re probably not going to be too thrilled about being there. Subsequently, if you aren’t happy to be there, you’re not going to be that productive of a worker. Simply improving the cleanliness of the workplace will improve company morale and lead to an even more successful business. How Do You Keep Your Workplace Clean? The easiest way to ensure your warehouse is properly being cleaned is to work with a professional cleaning service. Experienced cleaning companies can provide you with floor sweepers and floor scrubbers that will successfully pick up any spill and can clean up your entire work area. Before any cleaning is done, however, the most experienced and professional cleaning services will provide you with a free in-plant analysis of what will eventually be needed to fully clean a workplace and prevent further injuries. System Clean Inc. can both provide you with that analytical information and can effectively clean your entire industrial warehouse for you. Don’t wait until it’s too late to clean the floors of your business. If you wait too long, not only will your employee production levels decrease because of the unclean environment, but your workers will be at risk of serious injury. Get professional help from System Clean Inc. today.